One of the most common problems we see in laptops is a loose or broken power jack. Most laptop repair companies will try to sell you a new motherboard or a new laptop if you have a broken laptop power jack. 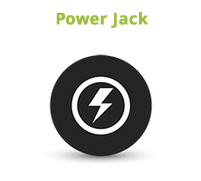 A broken power jack does not mean your laptop is ready for replacement. We provide a cost effective power jack repair service that can easily bring your laptop back to full use again. We can replace your laptop power jack so it will work like new. The time to fix your Laptop power DC jack depends on the amount of damage on your laptop motherboard. It ranges from just a couple of hours to a few days. The service price includes replacing or reattaching your laptop power jack on the motherboard.